It is with great pleasure and excitement that we announce the release of Amberlight 2 - a new version of art software that creates computer generated images and animations. Amberlight 2 is now boosted with many innovative features including advanced animation mode, modifiers and variations. From now on, you can breathe life into your artworks and create flawless animations saved as video or image sequences. No matter if you are an advanced artist or a complete art beginner, by playing and experimenting with Amberlight you have fantastic works of art within reach. The exciting swirling patterns, glows and light trails may resemble to fractal images, but equipped with original mathematics and easy-to-use interface, Amberlight really stands out. The great thing is that the results can be exported as an image, image sequence or a video file, imported into other graphic applications and become a part of bigger creative projects. 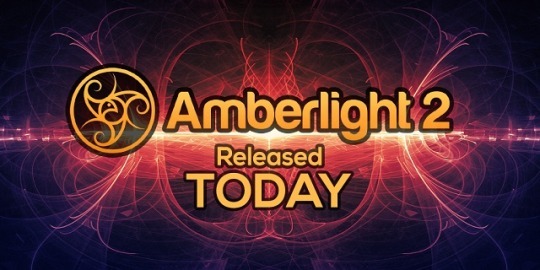 Amberlight 2 is available from March 8th worldwide for $59.99 for Windows and Mac OS via our shop. Existing Amberlight users pay the price difference between versions and can upgrade to Amberlight 2 for $29.99 directly through application’s menu: “Help –> Upgrade to Amberlight 2” or from our Upgrade page. Users who bought Amberlight 1 via Mac App Store and would like to upgrade for special discount, please send us your iTunes receipt of the Amberlight purchase to get the discount as well.